Having come here for the second time since the academic year 2005-2006 has moved me. Last time, it was for the joyous occasion of my friends’ wedding. I was basically a tourist the whole time. A fantastic way to see the island. As this other blog attests, I’ve done my share of touring in the past week and a half! However, besides the touring, I gave four seminars on patristics over three days, preached this past Sunday morning, and took a trip to North Cyprus to visit with the students and leaders involved in ministry in one of the unis there. This meant I spent a lot of time preparing — last minute touches on the seminars, including two last-minute PowerPoints, prayerful sermon prep, practising the seminars, that sort of thing. And the third thing — dinner with friends. Coffee with friends. Sitting around with Rick and Madara and talking. Talking, talking, talking. Talking about the student ministry of seven years ago. Talking about how it’s changed. Talking about the changing face of church in Europe and America. Talking about what a disciple is. Talking about making more disciples. Talking about what the Church Fathers have to say about a whole host of things. Talking and dreaming and hoping for flourishing ministry on this island and across Europe that can conform people to the likeness of the image of God’s Son –whether those people are Protestant, Orthodox, Roman Catholic, or have yet to enter the Christian fold. And I find myself missing life seven years ago. Oh, Cyprus Team! We all had long hair. I think we still do — I’ve lost contact with one of my team mates. But it was brilliant. Despite our team leader’s husband’s deportation and our sudden orphanhood. Despite the loneliness that left me crouched on my side on my couch one time crying, ‘I’m so alone.’ Despite the crooked taxi drivers. Despite ‘Stephen’ getting arrested for drunken disorderliness (he tried breaking into a periptero; these things happen). I tell you, it was brilliant. There was The Place. International students could come to the Anglican church hall and have some coffee/tea/squash, play board games/ping pong/badminton, listen to music, and hear some Gospel presentation. Those who were interested in learning more about Jesus could go out for coffee with one of the team. Or ice cream. Or just walk around in the Old City. Or maybe do a one-to-one Bible study. Or join one of a couple of Bible study groups. The exhilaration of sitting down with a bunch of Hindu and Buddhist Nepalis to read the Bible! The freshness these guys would bring to the Scriptures, the fresh eyes that hadn’t read the stories of Jesus 100 times, the fresh ears that hadn’t heard the deep resonances of Christian doctrine. I remember the pleasure one of my Nepali friends had when I got him his own Bible. He was so pleased to be able to read the Bible for himself! Another guy, an Egyptian who had spent years in and out of prison for converting from Islam, was happy just to have me over to his flat to eat copious amounts of food over and over and over again. I learned that hanging out can be tiring, but I also learned how much joy simply being there can bring to a lonely heart. I remember travelling up to Kyrenia and Famagusta to talk with students there, to hear about what sorts of things Jesus was doing on their campuses in the North. I remember first meeting the Orthodox, reading my first pages of The Philokalia, seeing my first frescoes, up in the Troodos Mountains. I remember the Hindu asking what he had to do to be baptised. I remember getting into the baptistery with him and our pastor/friend and helping baptise him in the name of the Father and of the Son and of the Holy Spirit. I remember being part of something big. Doing something where I could tangibly feel that what I did mattered. 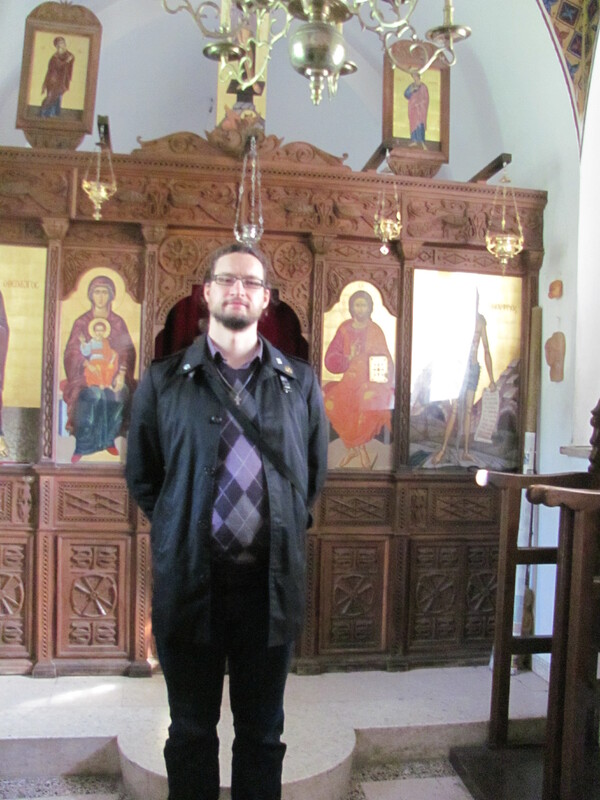 Where I wasn’t sheepish about being either Christian or ‘conservative/evangelical’. Where I was praying often and opening up the Scriptures with people on a regular basis. I remember being somewhere where what I did really mattered. Cyprus fills me with longing. And it’s not the Gothic architecture or the mountain monasteries or frescoes or black-robed priests or any of that I long for. Indeed. Isn’t bringing Christianity to a dark place enough and more than enough to be celebrated? I have no doubt St. Patrick would be a bit disappointed at the booze fest his feast has turned into, with green beards and pagan leprechauns everywhere. Still, the bringing of the light of the Gospel into a pagan land is a good thing, is it not? When we consider the polydaimonic/animist nature of much traditional pagan nature religion from Italy westwards, there is very often an element of fear. We like to romanticise this paganism, imagining these close-to-nature druids and bards who can speak with the very earth and commune with trees. Do not forget farmers who fear forests due to what lurks within, who have a very real fear of mounds due to the metaphysical beings who may dwell therein. If the surviving fairy stories from the period following Christianisation have any resemblance to pre-Christian beliefs, I’ve a feeling the supernatural was not something to be enjoyed but, rather, feared. When the Inuit of the Central Arctic came to Christ, they found freedom from a world full of spirits seeking to be appeased, a harsh, hostile world with no Great Spirit of the southern First Nations of Canada and the USA. They found eternal security in the person and actions of Jesus Christ, and were thankful for the Anglican and Roman Catholic missionaries who brought this great Good News of freedom to them. Considering how given over to Christ the Irish were to become following St. Patrick, no doubt they felt the same. St. Patrick (c. 387-460/493) brought Christianity to Ireland in the early fifth century. He was born six years after the triumph of Nicene Christianity over Arianism at the First Council of Constantinople in 381 and one year after the conversion of St. Augustine of Hippo; he was enslaved seven years before the Roman legions left Britain; the earlier date for his death is one year before Pope Leo I, the later date is 17 years after the fall of the last Roman Emperor in the West. St. Patrick is patristic, a missionary of the Late Antique world. Having read his Confession (hopefully this link will do the job, let me know if it fails), I’m of the opinion that he was of Romano-British stock; he was certainly from Roman Britain. When he was sixteen, he was captured and sold into slavery in Ireland. Although he made a daring escape, he made the decision to return thither later on and bring the light of Christ to the unconverted beyond the Empire’s borders. Patrick went to Ireland and preached, converting and baptising many thousands. He refused all gifts, for salvation is the free gift of God to all who believe. One story that I read somewhere was of a pagan prince upon whose feet Patrick inadvertently leaned with his staff during the baptismal rite. The young man endured the pain and said nothing, believing it to be part of the ceremony — such was their zeal for incorporating themselves into the glorious freedom of Christ’s Gospel as proclaimed by Patrick. There are also many tales of Patrick’s encounters with Irish priests (druids? ), whom he outdid in miracles, and many people whom he exorcised. His was a mission of preaching and miracles, much like our Lord’s. Much also like that of St. Columba, St. Aidan, and St. Cuthbert in Britain. The power of the Gospel was evident in the life of St. Patrick, saving the people of Ireland not only from captivity to the unclean spirits but also from captivity to the unclean spirit of each person’s own sinful soul. Shall we bring this Gospel of love and light to our neighbours? Shall we help cleanse their lives from the snakes of sin and fear? Two years ago, I published the first Saint of the Week, St. Columba. At the time, I focused on St. Columba’s missionary excursions which were primarily centred upon Pictland north of the Grampians (hence his sighting of the Loch Ness Monster). I have extolled the great goodness of missionaries on this blog often and feel no need to do so at present. St. Columba, however, besides being a missionary, monastic founder, and first-recorded sighter of the Loch Ness monster was also a wonderworker. In Adomnán’s Life of St. Columba, we read a whole host of tales about St. Columba’s miracles. Indeed, Adomnán’s Life is unlike any other saint’s life I have yet encountered. It consists entirely of miracle stories divided up thematically into three books: prophecies, miracles of power, and visions of angels. Within these categories there is no attempt at being chronological — indeed, he begins the prophecies with a posthumous vision of St. Columba had by King Oswald before Heavenfield Battle. Most hagiographies contain an abundance of miracle stories — or at least a few. They take their cue from our dear friend St. Antony as a literary inspiration. But they also set events out in some sort of chronological order — usually. So, for example, Cyril of Scythopolis’ Life of Savvas contains its share of miracle stories, but these are interspersed throughout a coherent narrative that tells us of Savvas’ monastic profession and monastic foundations. This coherent narrative is of no concern for Adomnán. He’s here for the miracles, pure and simple. The prophecies at times help people. Sometimes they are foretelling the future, but also they at times tell the truth about something happening elsewhere from wherever St. Columba happened to be at the time. They also come accompanied by the odd miracle of power or two. These are miracles of knowledge whereby God demonstrated His own omniscience, His abiding presence with St. Columba, and his concern for people who may otherwise have fared poorly. The second category of miracles is more familiar, being miracles of power. Miracles of power are what we tend to think of when we hear “miracle”. In the course of Book II, St. Columba turns water into wine for the Eucharist, he purifies a well for drinking, scares the Loch Ness Monster, brings good winds to friends, heals the sick, resuscitates the dead, and more. Book III contains the category of miracles I did not expect — visions of angels. These actually are relatively few, and are often visions other people had of Columba interacting with angels (vs. Shenoute hanging out with Jesus on a regular basis). This book also includes visions of light — visions of St. Columba shining with light from his face. While not unheard-of, this sort of phenomenon is not par-for-the-course hagiographic fare. It makes me think of Moses’ shining face at his descent from Mt. Sinai and St. Seraphim of Sarov who, himself, is reported to have had a shining face. Whenever people discuss hagiography, the admission that this stuff is not necessarily all true comes out. The Bollandists, since the seventeenth century, have been at the fore of the movement to extract the legends from saints’ lives and provide us with the genuine article. The path of Bollandist may be futile. The trouble is that, if we admit miracles, even a miracle that seems to be a literary topos could turn out being true. There is no way of being 100% certain which miracle stories are true, and which are false. When we look at St. Columba, we have to accept the fact that all three varieties of miracle gathered by Adomnán are present in the biblical record, in the Old Testament historical and prophetic books and in the Gospels and Acts. We have to admit, as well, that they abound throughout hagiographical literature from the third through the sixteenth centuries. And we have to admit that they are part of the charismatic and Pentecostal worlds, especially as seen in Africa and South America. So, if St. Columba is said to have been able to prophesy like St. Shenoute, or can raise the dead like the Prophet Elijah, or can calm a storm like our Lord Christ, or still the jaws of a fierce creature like Abba Bes, who are we to argue with Admonán? Instead, let us think upon these miracles. What do they tell us? Adomnán tells us that St. Columba turned water into wine for the Eucharist. This tells us two things: Christ’s followers can do deeds like unto his, and Holy Communion is an integral part of the Christian life. St. Columba raised the dead. Well, in this instance, it was the child of a recent convert from paganism. This tells us that God looks after His own and is the King of All, holding the keys to life and death. St. Columba prophesied the deaths of men, violent for the violent, peaceful for the peacemakers. This reminds us that he who lives by the sword dies by the sword, and that the kingdom of heaven belongs peacemakers (as well as the cheesemakers, I suppose). St. Columba calmed storms. Christ is the Lord of Creation, and His power runs through the lives of His followers. We need not fear destruction as Columba’s fellow-passengers did — for, even if we perish from this earthly world, God will not allow his holy ones to taste destruction. St. Columba closed the jaws of the Loch Ness Monster. Now, the Monster is a thing of great speculation, but a miracle concerning the closing of the jaws of a fierce beast was performed by Abba Bes in fourth-century Egypt once regarding a marauding hippopotamus, another time against a crocodile (Historia Monachorum in Aegypto 4.2). I have also seen a photograph of Elder Paisios of the Holy Mountain with a sparrow perched on his finger. These miracles concerning animals are a reminder that Christ reverses the curse from the Garden, that humanity was made to be master over the animal kingdom. These are the lessons we can learn from Adomnán’s Life of St. Columba, although we shall never be certain which miracles are true. 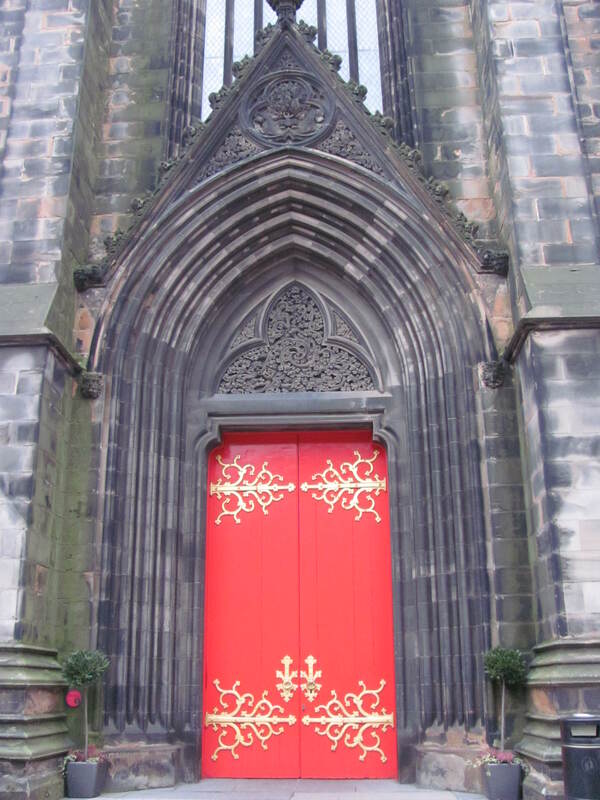 When we first moved to the beautiful city of Edinburgh, one of the first churches we encountered was St. John’s “Tollbooth” Highland Kirk. Except, actually, we didn’t. 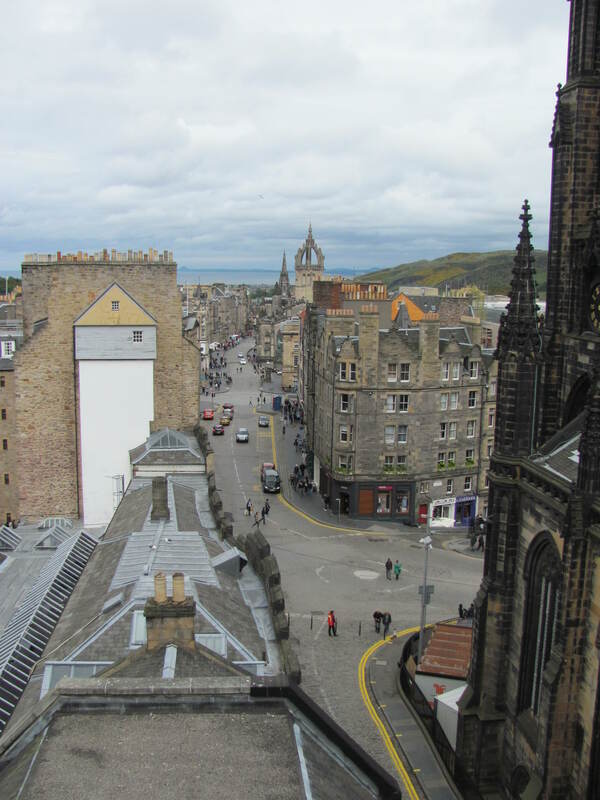 Instead, we met the Hub, a cafe, art space, event venue, and headquarters for the Edinburgh Festival. 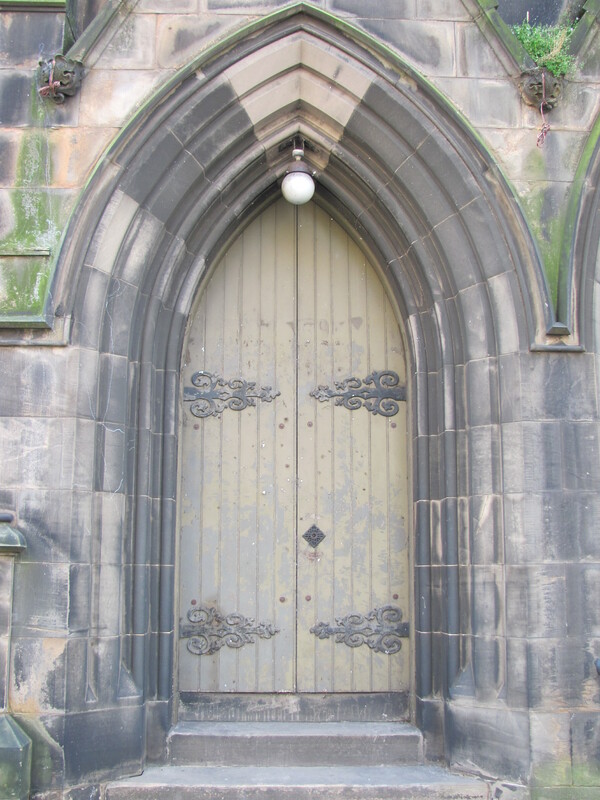 The explanation for the abandonment of two of the Royal Mile’s churches is the fact that the Old Town of Edinburgh, which boasted 52 400 people in the late 1800’s has but 4000 residents today. Most of its space is shops, restaurants/bars, and offices with the odd tourist attraction thrown in for good measure. 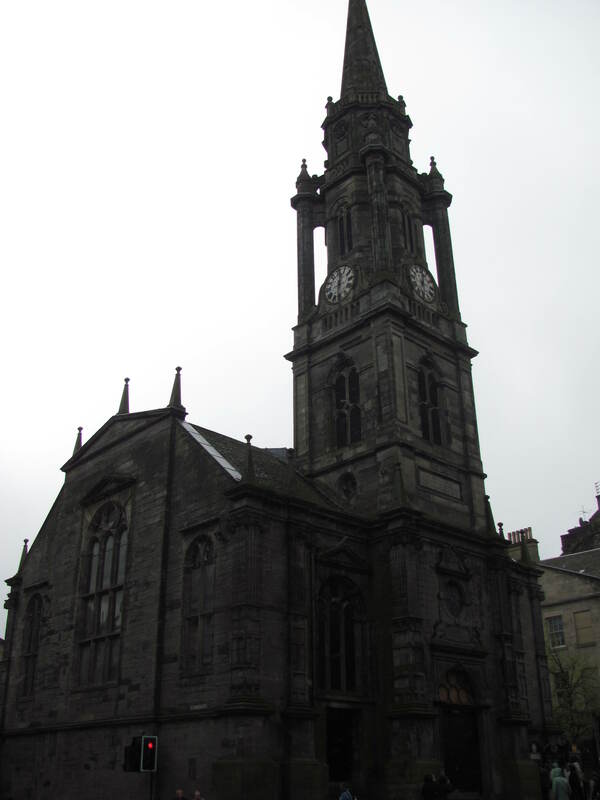 Thus, St. Giles’ (the “crown spire” visible between St. John’s and the Tron Kirk) together with Carubber’s Church, Old St. Paul’s Scottish Episcopal, and Canongate Kirk along the Royal Mile are able to serve the Old Town, along with St. Columba’s Free Church and St. Columba’s by the Castle Scottish Episcopal on Johnson Terrace, St. Augustine’s United on George IV Bridge, and Greyfriars Kirk. 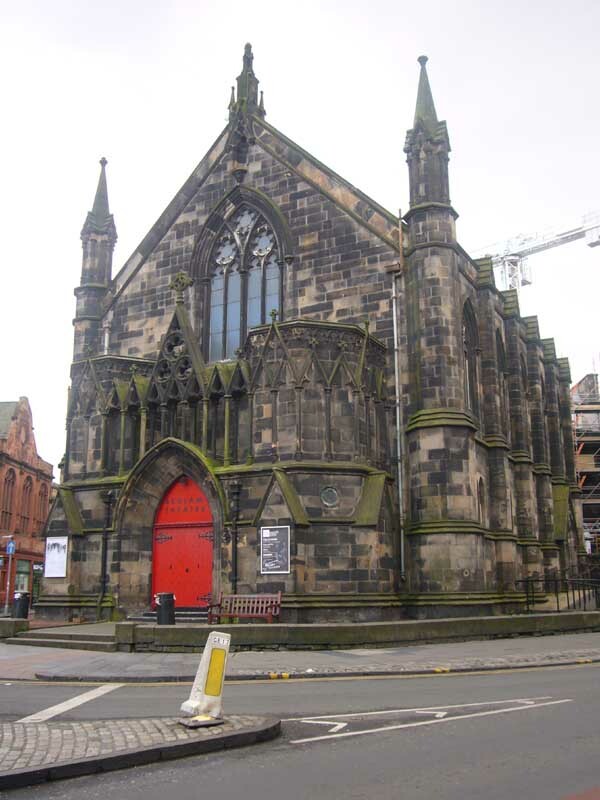 There is also St. Patrick’s Roman Catholic Church down on Cowgate. That’s a lot of churches for the Old Town. Yet if you tally the worshippers on any given Sunday in the churches of Edinburgh’s Old Town, I doubt you will get anything near 4000 congregants assembled. Charlotte Square, home of a beautiful old parish kirk that is now West Register Office, along with the rest of the New Town, has suffered a similar fate as the Old Town. People just don’t live there anymore. The churches have very few congregants, although Charlotte Baptist Chapel is able to pack ’em in like sardines. Another cause of un-kirking in this city is the death or amalgamation of some denominations. 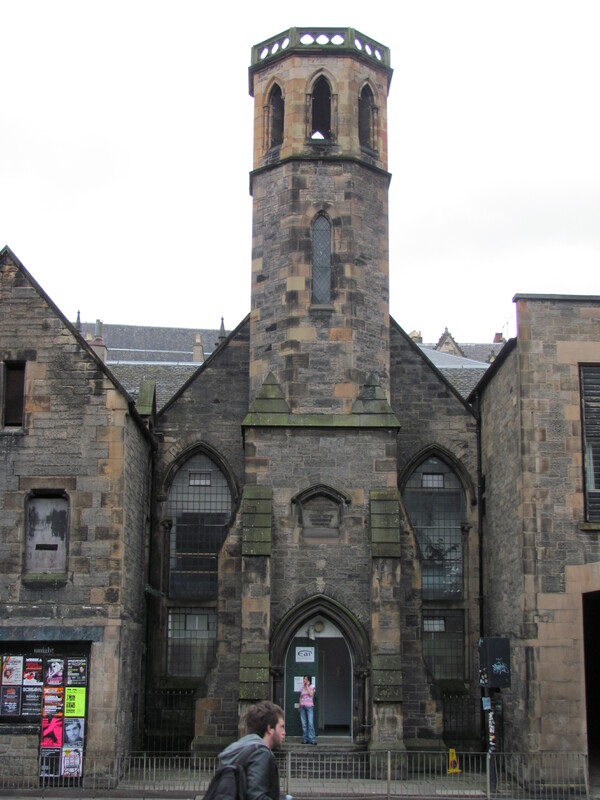 This was the case for Mansfield Place Catholic Apostolic Church, now the Mansfield Traquair Centre. The Catholic Apostolics thought the Second Coming was due in the 1920’s, so they made no plans for succession for their Apostles. By the 1950’s, Mansfield Place Church was closed. 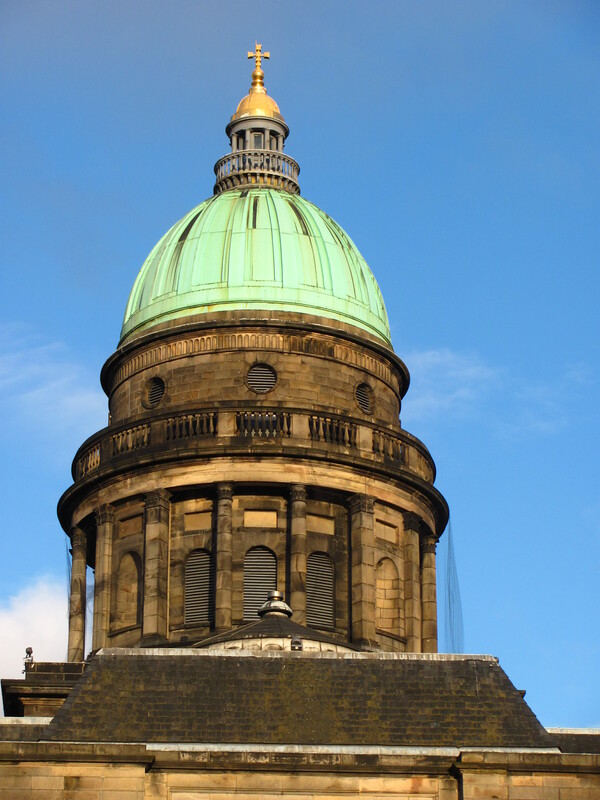 When the bulk of the Free Church of Scotland reunited with the Church of Scotland, the Free Church’s “High Kirk” become the library at New College, which means that students of New College get to study amidst some lovely stained glass! However, when we recall my statement that even with so many churches in the Old Town, the 4000 inhabitants still don’t fill them, we return to the main cause of un-kirking, and it is that people are no longer warming or filling pews. 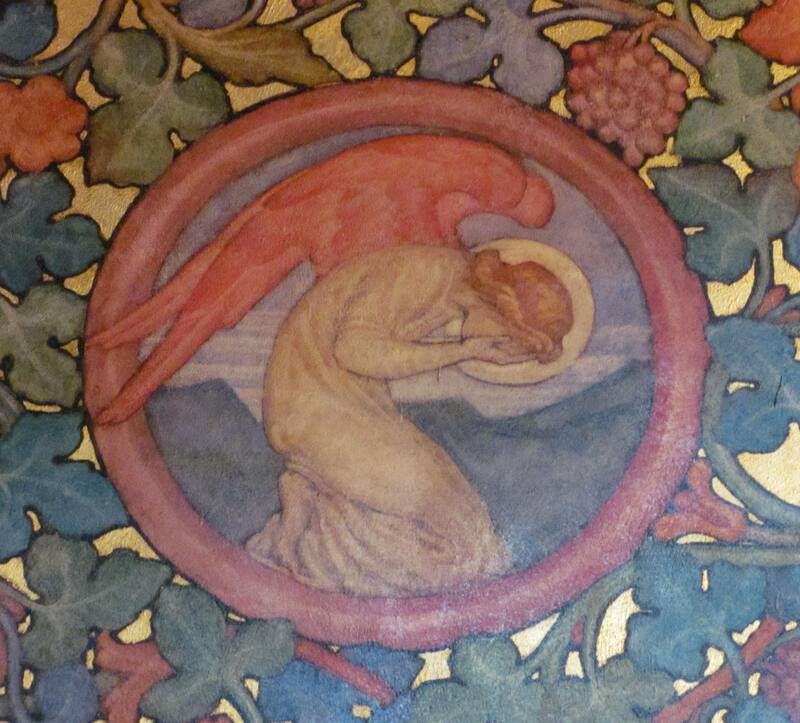 At a certain level, this makes Phoebe Traquair’s angel cry. People’s butts keeping pews warm as they did ever since they put the first pews in European churches in the centuries following the Reformation is not really what Christianity is about. Getting lots of people into your church doesn’t mean a thing in some ways. Yet those butts warming those pews are human butts. They are the butts of people who are beloved of God so much that He chose to become one of them. They are the butts of people who are beloved of God so much that He chose to die for them. They are the butts of people who need to hear and know the message of the greatness of the glory of God through the life, death, and resurrection of Jesus. At least if they are at kirk each Sunday, they stand a chance of hearing this message and being transformed by it. The un-kirking of Edinburgh and Europe is a phenomenon that, I understand, has been going on since at some point in the 1960’s. People just stopped going to church. Fewer and fewer people go to church every year. Even in the USA, which is imagined by many to be a “Christian” nation, the average Sunday attendance in 2005 was 80 persons — the megachurches are not offsetting the exodus. My friend Rick, pastor of an international, multicultural, “evangelical” church in Cyprus, says that the European church has entered a phase of exile. Our mission and ministry have different needs than ministry in places where the church is exploding in size, as in Africa, South America, and Southeast Asia. Our churches are dwindling, and people need the Gospel. Maybe we don’t need David Wilkersons per se in Europe. But we do need people who are willing to invest in these cities and the people who populate them. People willing to walk past the empty spires and remember the One Whose Cross is raised high above. People who are willing to love their unkirked friends to the bitter end. People who are willing to live across from drunks and junkies and love them ceaselessly and endlessly. People who are willing to truly befriend atheists and agnostics and take them seriously as people, not projects, not simply arguments with bodies. David Wilkerson went to sleep in the Lord on April 27 this year. And since any Christian in such a state is up for grabs to be Saint of the Week, here we go. There is a good chance that you don’t know Wilkerson’s name. However, you probably do know the name of one of his books — The Cross and the Switchblade, which was also made into a film. In 1958, David Wilkerson moved to New York City to bring the Gospel to the inner city gangs. He engaged in the risky business of outdoor, open-air preaching in the concrete jungle. And, unlike the guy I saw on Princes Street the other day, people actually stopped to listen. In fact, a couple of gang leaders came to Christ. One of these early converts was Nicky Cruz, whom you may know from his book Run Baby Run. Through the power of the Holy Spirit and the ministry of Rev. Wilkerson, Nicky was freed from heroin addiction and went on to become an evangelist himself. As Wilkerson’s ministry amongst Nicky and his ilk continued, they discovered that they had to find a way to help all of these gang members and street kids that was of a more material nature than simply answering an altar call. So, having established Teen Challenge, Wilkerson and his team took over some old houses and provided places for the teens to live, to learn some skills, to go through withdrawal — that sort of thing. If I remember correctly (the reference would be Twelve Angels from Hell), Teen Challenge also started a farm ministry for these kids who knew naught but the city to and experience God’s creation as part of the work. One problem Wilkerson faced as the numbers of new converts grew was the fact that often people would be on the straight and narrow for a short while but eventually return to crime, drugs, and gangs. He asked Nicky and some of the first converts, who were now sort of senior members of the Teen Challenge community, and they said they were able to stay away from their old life after their baptism in the Holy Spirit. Now, you may not be a Pentecostal like Wilkerson, but the experience of being overcome and overflowed with the Holy Spirit is something many a Christian can attest to, Pentecostal or not. This is the event that they learned was very important in helping these young people with broken lives and broken worlds become fully fixed by the living Christ. Teen Challenge still exists to this day, working among the broken teens of the inner city. In 1987, Wilkerson founded the Times Square Church, bringing the Gospel in a permanent way to New York City. Apologies also for how Orthodox this blog is getting. I’ll try to play to my Anglican and Evangelical constituents a bit more someday. For now, though, I would like to discuss two stellar exemplars of missionary work who can inspire Christians of all stripes, from evangelical Baptists to charismatic Anglicans to Pope Leo XIII (who enrolled them into the western calendar of saints in 1880) and the Russian Orthodox. In the West, the “Holy-Equal-to-the-Apostles” Cyril and Methodius, Apostles to the Slavs and co-patrons of Europe with St. Benedict of Nursia, are commemorated in the West on the same day as St. Valentine (he was the weekly saint a year ago), in the East they share a feast on May 11. Sts. Cyril (d. 869) and Methodius (d. 885) were brothers from Thessalonica. St. Cyril started his career as a librarian at Ayia Sophia (librarians can be destined to greatness, and not just Rex Libris!) while St. Methodius served as a soldier. Both left their secular employment to become monks. It seems that they began their work not among the Slavs but among the Khazars when their king asked the Byzantine Emperor Michael to send missionaries for them to learn more about Christianity and the Trinity. There is a chance that they converted the king and many noble Khazars to the Christian faith, but I don’t vouch for the accuracy of that (if you CAN, please tell us in the comments with a citation). Their big work, their life’s work, began in 862 when a similar petition was made by Rastislav of Moravia for people to come and instruct him in the Christian faith. The monastic brothers from Thessalonica were sent to fulfill King Rastislav’s request. There was already a Christian presence in Moravia, founded by western missionaries, and Cyril and Methodius came to continue their work, as Rastislav had expelled the western missionaries in his angling for political power against the Frankish King (Mediaeval and Byzantine religion is never far from politics). They set about organising the church ministry and hierarchy. Whilst in Moravia, it is said that they met some of the western missionaries whom they said believed the “Heresy of the Three Languages” — that worship and the Scriptures could only be in one of three languages — Hebrew, Greek, or Latin. This was clearly contrary to how Cyril and Methodius envisaged the church operating, for they devised a new alphabet for the Moravians and their language, then proceeded to translate service books into the local tongue. The Heretics of the Three Languages opposed this, but, apparently, the pope supported such action and protected Sts. Cyril and Methodius (see abbamoses). Indeed, their work was so highly favoured by Rome that Pope St. Nicholas I himself invited them to Rome and praised them for their work, despite the attempts of certain Roman clergy to claim that the Thessalonian brothers were messing around in their turf. This was in 867. They returned to Moravia and continued their work, not only structuring the state-supported church but evangelising as well. In 869, Cyril died. St. Methodius continued the work alone until his death. Unfortunately, after the death of these brothers, the pressure against their followers in Moravia (from fellow Christians!!) was so great that they left and brought the Gospel and the Cyrillic alphabet to the Bulgars instead. That alphabet was the basis of the alphabet for all Slavic languages today, Russian, Ukrainian, Bulgarian. That missionary enterprise was the basis of the Slavic churches today as well. God bless Sts. Cyril and Methodius. Their approach, going so far as to create a new alphabet, is reminiscent of missions to the First Nations of North America, especially the efforts among the James Bay Cree to create a syllabary (by James Evans) with the New Testament for the new believers (adapted for Inuktitut by Edmund James Peck, saint of the week here). May we all seek to translate the everlasting Gospel of Christ into the language of the people, be that language postmodern English, modern Greek, an Amazonian language, or Scots — and communicate it to the hearts of the people that they may understand and find Jesus, with the Gospel taking root in their lives and producing the fruit of the Spirit. My wife and I spent last weekend in Glasgow. 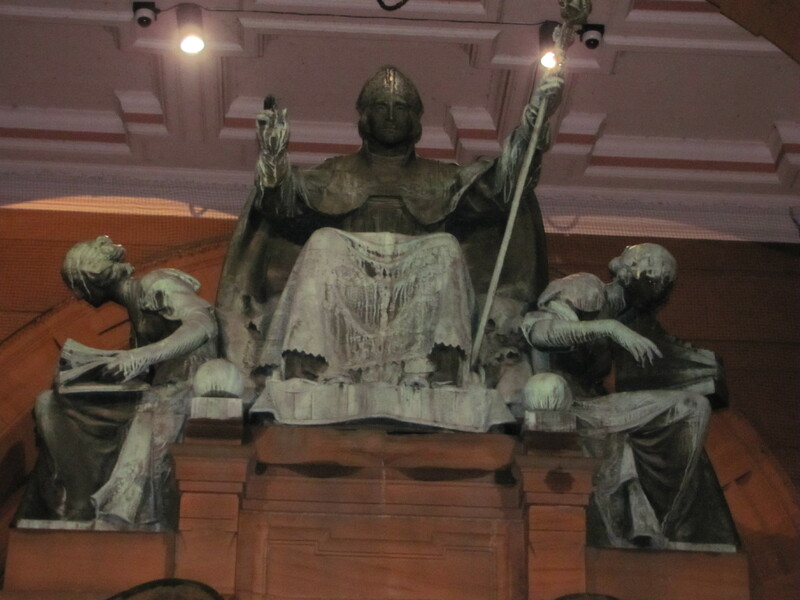 All over Glasgow, you will find images and statues of St. Kentigern, as pictured in my photo to the left showing the entrance to the Kelvingrove Museum and Art Gallery (which has some very nice mediaeval armour). St. Kentigern is commonly called by the name “Mungo” (silly as it sounds) which seems to be derived from the Brythonic word for “dear one”. Dear St. Kentigern was born c. 518 in Fife to a family of local Celtic “nobility.”* He may have been raised in a monastery. It does seem, though, that at age 25, he was present in Glasgow as a missionary. He was welcomed by Roderick Hael, King of Strathclyde, and by 540 was consecrated bishop. He lived an ascetic lifestyle and converted many people to Christianity through his preaching and holiness of life. In 553 he was compelled to leave Strathclyde due to anti-Christian opposition. 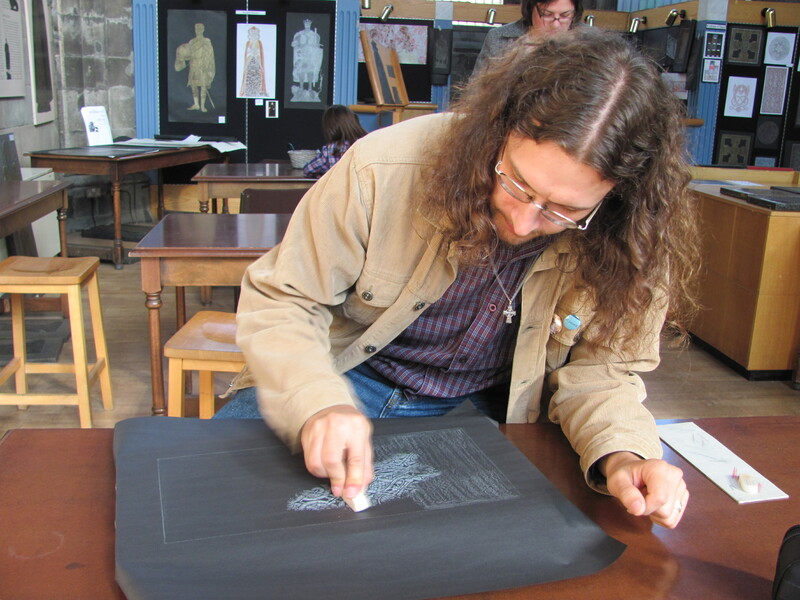 He spent time in Wales with St. David and founded a monastery while there. In 573, he was able to return to “Scotland”** after the triumph of Christians at the Battle of Arthuret. He hurried back to King Roderick’s side with some Welshmen to join him. He spent his first eight years of his return to Cumbria evangelising Galloway and Cumberland. In 581 he returned to Glasgow and lived out the rest of his days as bishop of that city. 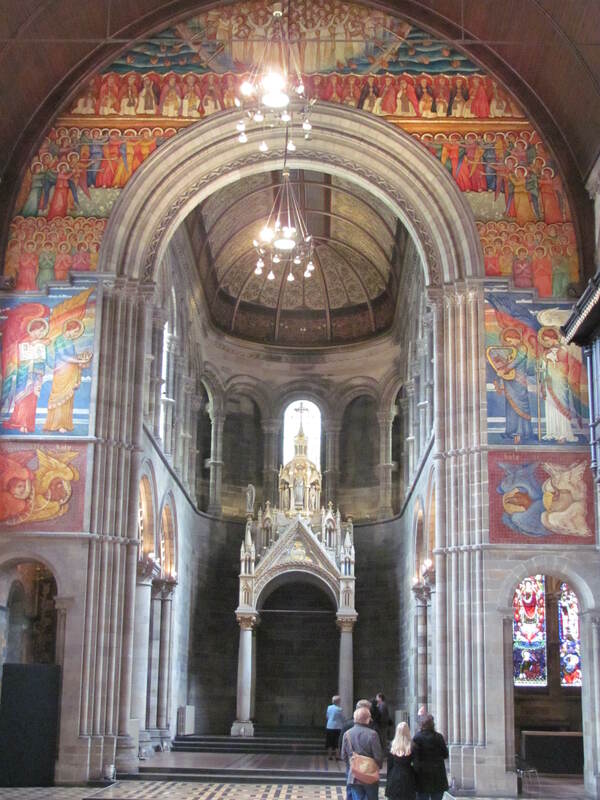 During this final sojourn in Glasgow, he was paid a visit by St. Columba (my post on him here). The two Celtic missionaries had a long talk with each other and exchanged pastoral staves as a sign of friendship. St. Kentigern died in 603 and was buried in Glasgow where he apparently still rests in the cathedral’s crypt. His feast was this past Thursday, 13 January. Enough with history, though. 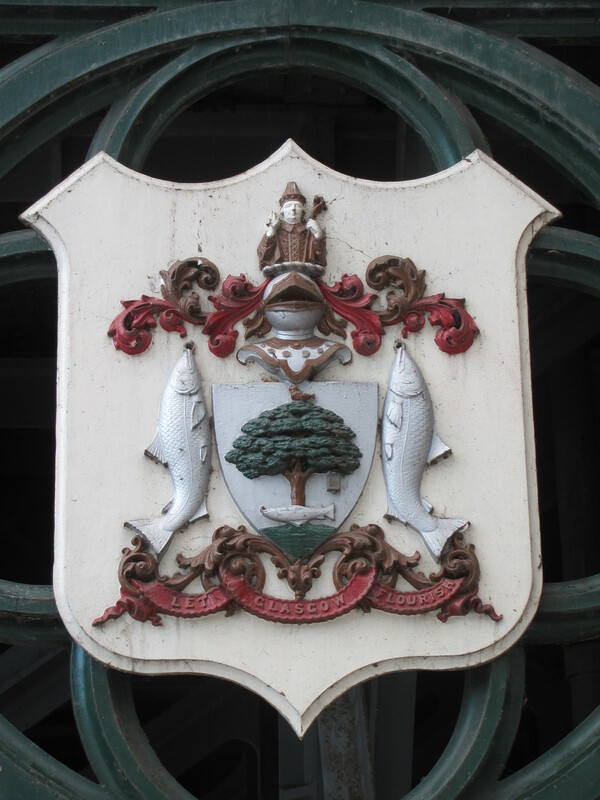 St. Kentigern is well-known for his hagiography, with symbols from his miracles making their way onto the Glasgow coat of arms (as seen in my photo of them on the side of a bridge over the Kelvin). The Bird — Mungo restored life to the pet robin of Saint Serf, which had been killed by some of his fellow classmates, hoping to blame him for its death. The Tree — Mungo had been left in charge of a fire in Saint Serf’s monastery. He fell asleep and the fire went out. Taking branches from a tree, he restarted the fire. The Bell — the bell is thought to have been brought by Mungo from Rome. It was said to have been used in services and to mourn the deceased. The original bell no longer exists, and a replacement, created in the 1640s, is now on display in Glasgow. Thus St. Kentigern. His real legacy is the Christian faith that took hold in Glasgow and other parts of western Scotland and flourished for centuries, although it seems to be in a bad state just now. Perhaps we need a new St. Kentigern, another dear Mungo, to bring the Good News of Jesus Christ to the people of Scotland. *I do not deny their nobility, just our postmodern, post-Germanic-feudal understanding of what Celtic nobility would have been. **Not yet called Scotland; too few Irish Scots. Called variously Cumbria, Caledonia, Alba.